Osteopenia is known as the early signs of bone loss that can develop into osteoporosis. With osteopenia, bone mineral density is less than normal, but not quite low enough to be considered osteoporosis. A bone density test is best to help determine osteopenia. Osteoporosis is a disease in which bones start to gradually become fragile and more likely to fracture. Osteoporosis is a major health concern, as it affects more than 10 million people in the United States. Bones can become so brittle and weak that simply bending over or coughing can cause a fracture. Most of the time, osteoporosis fractures occur in the hip, wrist, or spine. 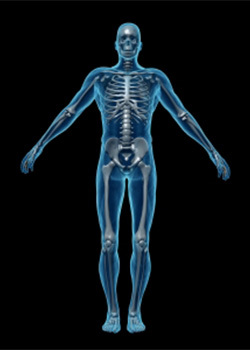 Every bone in our body is living tissue, which is always being absorbed and replaced by newer tissue. Osteoporosis occurs when there is not enough new bone created to replace the old bone. Your bones are constantly creating new tissue to replace older tissue. At a younger age, your body can create new bone quicker than it breaks down old bone–so your bone mass increases and you grow. Commonly, most people reach their peak bone mass in their early 20s. As you get older, you lose more bone mass quicker than your body can create it. How likely you are to develop osteoporosis is determined partly on how much bone mass you accumulated when you were young. The most important time to focus on building healthy bones are the first 3 decades of your life. Having sufficient bone-building nutrients, as well as weight-bearing exercise and a healthy lifestyle is the best protection against osteoporosis. Naturopathic Doctors use non-invasive and natural approaches to treating conditions, including osteoporosis, by supporting the improvement of your nutritional status through diet, exercise, and lifestyle counseling. The best tool for a healthcare provider to give to their patient is education–with lifestyle changes, osteoporosis is a preventable disease for most people.